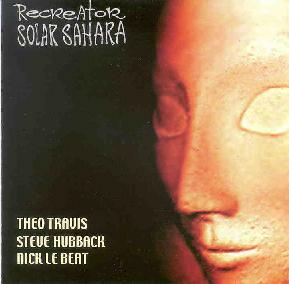 A trio led by bronze and blacksmithing, wind-and-metal musician Steve Hubback, Recreator is virtually unclassifiable, save that elements of contemporary jazz, electronica and tonalities of the far east are anchoring elements on this disk. Because Hubback is also a sculpture who creates many of his own percussion instruments, to wit: hammer and bowed steel harps, various gongs, many of which look like no instruments this reviewer has ever seen, incorporating sword-and-sorcery motifs like dragons’ wings and heraldic polygonal shields, Recreator’s music is informed by these influences. The opening track "Ancestral Space" is anchored by wind chimes and Nick le Beat’s sound sculptures, with the inspired sax noodling of Nick le Beat, takes the listener in a kind of pseudo eastern meditative space. "Beyond Fire" is lead by le Beat, this time his synths echoing Hubback’s improvised metal percussion grooves, while Le Beat’s sax lends jazz in the final third of the epic twelve minute tune. "Earth Links" has an easy, meditative new age vibe. "Gate Keeper" ups the ante by injecting a note of electronic menace and urgency — perhaps even troll-like energy in the background, while the opening sax sounds are reminiscent of the jazzy break at the end of Yes’s song "Then" from the album "Time and a Word". Then the percussion kicks in and we’re heading for Tantric heaven. "Listening Stone" is a gentle transitional piece and the final (title cut) again showcases Hubback’s fascinating soundscape, courtesy of his collection of gongs and metallic harps, with a throbbing, yet gentle percussive thrust. Le Beat’s flute adds an air of mystery, entrancing the listener. Solar Sahara is strongest in its opening shots and closing salvos — Hubback is clearly the conceptual captain of the team. May he lead them deeper into the far ranges of his imagination! For more information you can visit the FMR Records web site at: http://www.fmr-records.com. You can visit Steve Hubback's web site at: http://hubgong.dse.nl/.